Just in time for summer, we’re excited to announce not one, but TWO nutrition challenges happening at Arsenal Strength beginning this month! 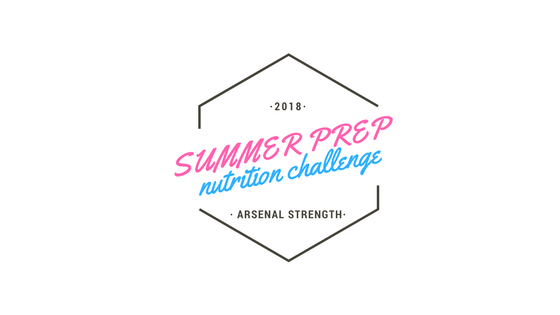 In an effort to meet the needs of the wide variety of individuals at Arsenal Strength, we’re going to be running two simultaneous nutrition-focused challenges. Each challenge is 6 weeks in length and will help you improve your habits get into better shape before summer. We have a beginner/intermediate challenge as well as an advanced challenge. Our beginner/intermediate challenge is the “Arsenal Nutrition Challenge” which helped participants lose as much as 18lbs last fall by focusing on the habit of eating REAL food. Over the course of 6 weeks, you’ll learn the power of eating real, whole foods and consistently getting movement in. It’s stupidly simple but surprisingly effective. While weight loss isn’t a primary objective of this challenge, it’s almost inevitable if you’re following the guidelines. Several guides to take the guesswork out of nutrition including our Kitchen Klean Up guide, Clean Eating guide, meal-planning template, bulk cooking guide and more. Initial screening and body composition analysis at the gym using our impedance scale. Our advanced program is a 6-week transformation challenge that focuses on the technique of “carb-cycling.” Because this is an advanced nutritional strategy, participants should already show consistency in basic nutrition principles like consuming mostly whole foods including fruits and veggies, meal prepping and proper portion sizes. This challenge will not be easy for most, which is why it’s meant to be done only for 6 weeks. You’ll need to be OK with eliminating most carbohydrates from your diet for periods of time and preparing your meals ahead of time to be successful. A complete nutrition guide including a layout of the entire challenge, example meal plans, meal planning templates and a portion-sizing guide. Breakfast, lunch and dinner recipes as well as an ultimate shake guide. Initial screening and body composition analysis using impedance scale at the gym. Bi-weekly updates to body composition (performed privately at the gym). Unlimited messaging with your coach. How do the lessons and check-ins work? Each day you’ll receive a lesson via an app on your smartphone (or email) as well as a daily check-in. It’s a simple YES or NO to one or two questions related to your compliance the previous day. All of those yes’s and no’s add up to a compliance score that helps your coach see whether you’re on FIRE or fizzing out. How do I know which challenge is right for me? If you have completed a previous nutrition challenge at Arsenal and were able to maintain at least an 80% compliance score, you’re probably OK to give the advanced challenge a try. This doesn’t mean it will be easy for you but you’ve shown consistency which will help you be more successful with this challenge. If you’re not sure which one is right, reach out to Steve at stephen@arsenalstrength.com. Can I switch challenges after starting? No. Because we move through the challenge a “team” you’ll miss too much in either challenge if you switch after beginning. Can I do both challenges? No. Our platform only allows us to assign one program per participant. $99 for members. $149 for nonmembers. Have more questions? Reach out to Steve at stephen@arsenalstrength.com or email vince@arsenalstrength.com to sign up.